Five-time Tour champ Bernard Hinault has been one of Chris Froome's toughest critics, and it seems that won't change soon. FLORENCE, Italy (VN) — Former French cycling great Bernard Hinault says he will not stop speaking out about the Chris Froome case or the changing sport. 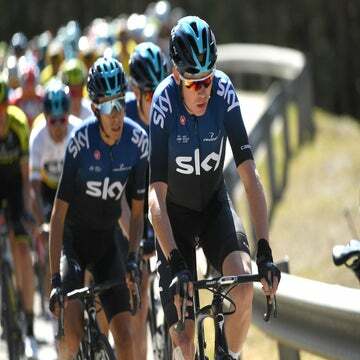 The five-time Tour de France winner blasted Chris Froome over his asthma drug case stemming from the 2017 Vuelta a España. The UCI, however, dropped the case against Froome because he showed his levels fluctuated within a reasonable range. “Froome spoke recently about my age after all my statements about him,” continued Hinault this week. Froome said before that he is a long-time asthma sufferer and has treated his symptoms for 10 years. At the Vuelta, he had tested over the limit for Salbutamol on stage 18. Hinault raced through the 1970s and 1980s. He won three editions of the Giro d’Italia, twice the Vuelta a España, and five times the Tour. “You will still say that I am an old fool, but I know the history of cycling,” he continued. ‘The Badger’ worked with Tour organizer ASO until retiring last year. At the 2018 Tour, won by Froome’s teammate Geraint Thomas, Hinault only attended three stages. He said he has trouble recognizing the sport. “At least at the buses. There are riders who stay on the bus and leave at the last moment without speaking to the public. No more exchange [with fans], but it’s their life, not mine,” continued Hinault.